It seems appropriate that after 18 years running Nottingham Playhouse, Giles Croft’s final production is Anton Chekhov’s 1904 valedictory masterpiece The Cherry Orchard – a play which is all about change. Chekhov portrays the end of an era as the landed gentry are superseded by the merchant class, while also hinting at even more radical upheavals to come in Russian society. One hundred years on from the Bolshevik Revolution the world is once again full of turmoil and uncertainty. Simon Stephens’ direct, stripped-down version, first staged by Katie Mitchell at the Young Vic in 2014, is sharply colloquial and more bleak than elegiac. But Croft’s sensitive, finely-balanced revival captures both the pathos and the absurdity of an old order living beyond its means and sell-by date. 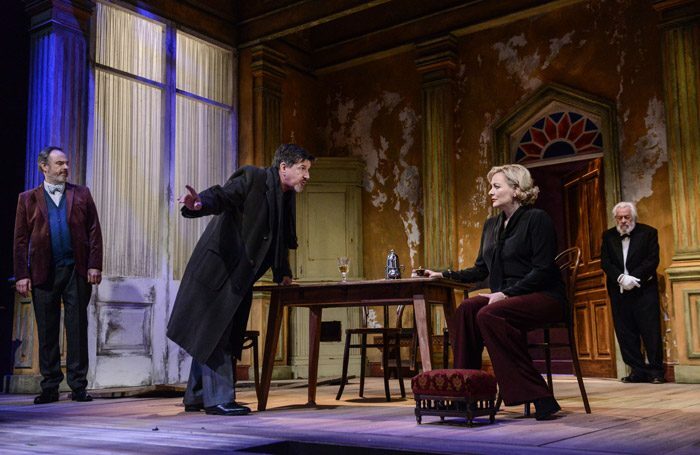 Tim Meacock’s design of peeling walls and discoloured pillars is a picture of faded grandeur, with the set virtually dismantled in the final act after Madame Ranevskaya’s beloved ancestral home is sold at auction to pay the family’s debts. Sara Stewart excels as the charmingly vivacious but wilfully unrealistic Ranevskaya, with a slightly theatrical presence, who proudly refuses to let the famous cherry orchard be cut down and ends up losing the whole estate. As her nemesis Lophakin, son of a former serf turned nouveau riche businessman, John Elkington is blunt-speaking but unusually sympathetic as he tries to bring the family to their senses before seizing his opportunity. Babirye Bukilwa’s pragmatic Varya vainly tries to instil some prudence into the household but is left high and dry. Jamie de Courcey’s eternal student Peter advocates social progress while being aware of the pain this can entail. And Graham Butler’s heartless, upwardly mobile Yasha puts the boot into Kenneth Alan Taylor’s faithful ancient retainer Firs who cannot move on from the old world.